PLOT SUMMARY: Sawyer is secretly relieved when her boyfriend, Kevin, suddenly dies in a drunk driving accident. Although he appeared to be the perfect guy on the outside, Kevin was abusive and controlling, and Sawyer was never able to tell anyone about it. So, the accident is a blessing -- until it becomes clear it wasn't an accident, when Sawyer finds a note in her locker that simply reads, "You're welcome." FIRST THOUGHTS: I debated with myself for quite awhile on whether or not I wanted to do a full review of this one. I decided on "yes," but I wasn't sure, mainly because this book reminds me of so many other books I've read -- some better, but some a lot worse. (I'll get into that down below.) This wasn't the worst book I've read by a longshot, but there's so much it could've done better, and so much that was done better by other authors. Of course, I didn't go into this book expecting great literature; I went in expecting something fast-paced and easy to read, and that's what I got. So, hooray for met expectations? THOUGHTS ON PLOT: OK, so I really like murder mysteries, and stories about stalkers, so I thought this would be a fun read. Unfortunately, all the red herrings felt really tedious, and it was written in such a way that no matter who the killer turned out to be, I wouldn't be happy. The choices were all either too obvious, lacking any buildup, or just plain insulting -- not what you want from a murder mystery. I also didn't like the ending at all; after all the drama, the main character seems to be completely unaffected, and just goes on her way, riding off into the sunset with her new boyfriend. (Whether this is a plot, character, or writing style issue is anybody's guess.) There were also flashbacks to when Kevin was alive, but they felt like wasted opportunities more than anything; for all the damage Kevin allegedly did, we don't get to see much of it. THOUGHTS ON WRITING STYLE: Fast-paced, but unpolished and not as exciting as a mystery should be. There are some minor plot holes (even with the killer's identity being revealed, I'm still not sure how they knew some of the things they did), as well as a couple grammar errors here and there. I got through this book slower than I meant to, mainly because I didn't sit down and read it as much as I meant to. When I did, I often read 50 or more pages in a sitting, but the sittings were spaced out because I had very little desire to know what happened next. THOUGHTS ON POLITICAL STUFF: Yeah, I'm gonna get into spoilers here. If you want to read this book, skip this section. You have been warned. First, the obvious -- there are no POC characters, and the way the topic of Sawyer's abusive ex is handled is... clunky, to say the least. However, by far my biggest gripe is that this is yet another book that uses the Psycho Lesbian trope. (If you don't know what that is, I discussed it at length here.) Yeah, yeah, spoiler alert: the killer is Chloe, and she did it to prove her love to Sawyer. And yes, Chloe is the only queer character in the book. I was instantly reminded of The Cabin -- a book which, as some of you may remember, I absolutely despised. (That review is here.) While this book's treatment of Chloe is marginally better than the queer character was treated in The Cabin -- Chloe at least is portrayed somewhat sympathetically and has more than one personality trait -- it's still the same end result: a predatory lesbian doing unspeakable things in pursuit of an innocent straight girl. It's such an ugly, tired, hurtful cliche, and I really thought this author was better than that -- I've read some of her other work and thought she was quite good. Honestly, I called that Chloe was gay from the second she was introduced (it's a gift), and I suspected she was the killer from about fifty pages in. But I thought, "No, they cannot possibly go there. This author is not that clueless." But, apparently, she is. Say it with me, folks: it's not that lesbian characters can't be evil, but if your only lesbian character is evil, we have a problem. FINAL THOUGHTS: Disappointing. While this book didn't fill me with the same, unquenchable fury as The Cabin (*war flashbacks*), it did fill me with a whole lotta "ugh." This October TBR list is not working out for me so far, is it? So far, we've got a DNF and two books I didn't like. Agh. But, I still have a week left -- while I'd be surprised if I got through both Shallow Graves and Vicious in that amount of time, I'm gonna try and get through at least one. Onwards! Thank you so much for reading this review. If you liked it and would like to support my work, click on either of the buttons below to donate -- Buy Me a Coffee is a small, one-time donation, but becoming a Patron has several benefits and rewards. Either way, it's a huge help to me. A special thanks to those of you that choose to contribute! 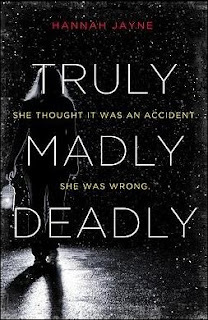 If you've read Truly, Madly, Deadly, tell me what you thought of it in the comments below.